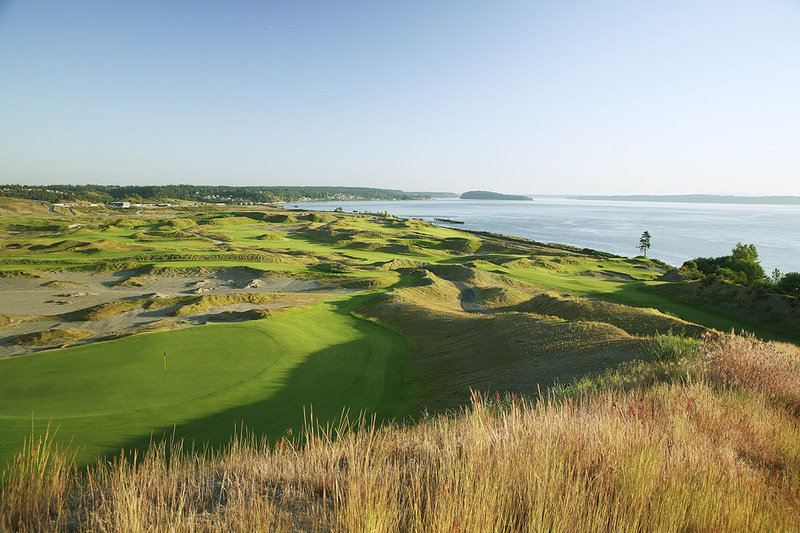 Chambers Bay on Puget Sound will host the 2015 U.S. Open. Photo credit: Aidan Bradley. Walking the fairways of a golf course set to host a major championship is a claim few can make. In less than three years, Chambers Bay will welcome the world’s best golfers, some 250,000 spectators, and a television audience of millions when it hosts the 2015 US Open. Until its debut on the world’s stage, though, Chambers Bay provides the common golfer—both visitors and locals alike—an experience like no other. It doesn’t take long to notice that the focus at Chambers Bay is on the course itself. You won’t find a lavish clubhouse upon entering the grounds. No tech-savvy golf carts (they aren’t even allowed on the property) or a state-of-the-art practice complex. These distractions are simply unnecessary and you’ll understand why when you arrive at the first tee. Four- and-a-half hours of smiles, screams, laughs, cringes and, a headache or two later, the term “pure golf experience” is finally comprehendible. So why talk about golf in November? Glad you asked. Nestled into the hillside of an old sand and gravel mine, Chambers Bay features a Scottish links style that is rarely seen in the United States. The result is a course that welcomes the elements of the Pacific Northwest. Its true colors are best shown when Puget Sound winds and rain influence your every shot. The views are remarkable and the landscape is dramatic—whether rain or shine. It is an experience that is enjoyed year-round. Plus, why not save a few bucks during the fall season? Chambers Bay is located in the small community of University Place, about nine miles west of downtown Tacoma and forty miles south of Seattle. Check out Tacoma’s Hotel Murano for upscale accommodations at an economical rate. The hotel offers a variety of golf-themed packages with Chambers Bay and other premier course in the region, including spa and shuttle perks, so call ahead to hear about their current offerings. Additional information is available at www.thechampionshipexperience.com. When you’re shuttled from the clubhouse down to the first tee and practice areas, take note of the world map located in each shuttle bus. Visitors are encouraged to mark their homeland with a pushpin on the map and it is immediately apparent that golfers from all corners of the globe have trekked to Chambers Bay. Already established as a golf mecca, the notoriety of Chambers Bay will only continue to grow in the coming years.